Last week I went to the ‘concert-of-a-lifetime’ – Bruce Springsteen. What does this have to do with Picnic at Hanging Rock, a story about a group of Australian schoolgirls written by Joan Lindsay in 1967? Hanging Rock is the common element. 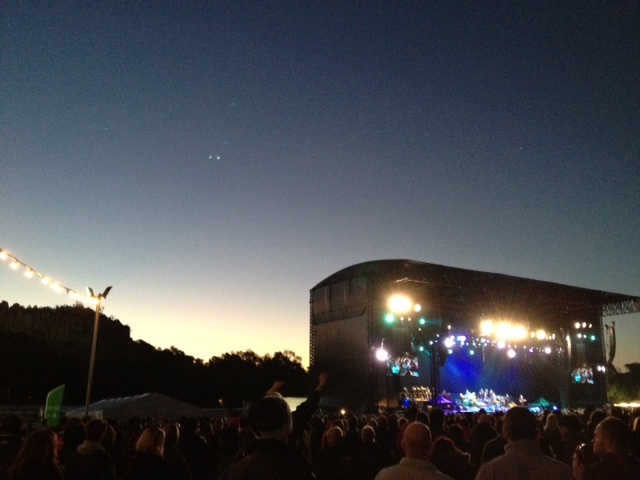 The stage at the Springsteen concert (first image from here and the other I snapped on my phone) was set against the backdrop of the spectacular Hanging Rock. Given that it is also Australian Literature Month (hosted by Reading Matters), I thought it fitting to revisit one of my favourite stories. It’s been more than a decade since I last read Picnic at Hanging Rock. The story is simple – on Valentine’s Day in 1900, a party of schoolgirls from Appleyard College for Young Ladies went on a picnic to Hanging Rock. After their lunch, a group of girls decided to climb the Rock. Some of them never returned. 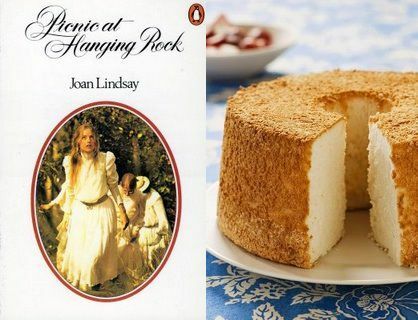 When it was first published, there was much speculation as to whether Picnic at Hanging Rock was fact or fiction (it’s fiction but in the days before the internet there was no immediate way to get an answer). Furthermore, the unresolved ending of the story kept the mystery alive and is part of its charm. Lindsay’s original draft included a final chapter in which the mystery was solved. At her editor’s suggestion, Lindsay removed it prior to publication. However, in 1987, the final chapter – titled The Secret of Hanging Rock, was published posthumously. I’m not terribly good at reviewing re-reads and this is no exception. My feelings about this book have built gradually, after countless readings, the enchanting movie version directed by Peter Weir in 1975, and of course the fuss when the final chapter was released (I do remember going to the bookshop immediately after school and standing there to read it!). Lindsay is often criticised for creating ‘obvious’ characters – the beautiful, whimsical Miranda; delicate and doting Sara; ugly, plodding Edith; and the nasty Mrs Appleyard. Yes, the line between ‘good’ and ‘evil’ characters is clear but I think it adds to the fairytale quality of the story. Small details unfold to add to the mystery – Irma’s missing corset; the mass hysteria of the school girls akin to scenes from the Salem witch trials; visions of white swans and so on. Each detail is doled out gradually and skillfully, causing readers to lose their footing. It is impossible to visit Hanging Rock without thinking about this story, although I suspect this is largely due Weir’s critically acclaimed film and its haunting soundtrack. I have never had any success with angel cake, although I’m happy to eat other people’s efforts. 4/5 For the sense of place and time, for the lingering mystery. What a treat to revisit this story that looms so large in our imaginations — even for those of us who live on the other side of the world. I remember the film and watched it again after reading the book for the 2012 Australian Literature Month. I love that you saw a Springsteen concert there. Thanks for sharing your memories. If you’re ever visiting this side of the world, Hanging Rock is worth a stop – it is truly amazing. Great photos and I’m glad you enjoyed ‘The Boss’. I read Chapter 18 – and hated it. Thankfully it was so long ago I have forgotten the detail. I suspect if I was only reading the book for the first time, I’d be very tempted to seek out the final chapter! Thanks for the link. You can continue to hate that ‘missing chapter’ as it is most likely a sham. See below. What an amazing experience seeing Springsteen in that setting would have been! I reread this a few years ago and have been meaning to go and visit Hanging Rock ever since! One day I wll actually do it! 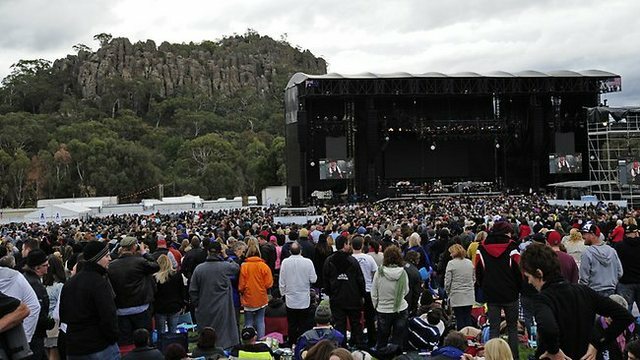 I felt very lucky to go to the Springsteen concert there – he was on in Melbourne but the lure of an outdoor concert with Hanging Rock as the backdrop was too much to resist. I’ll never forget being at the Hanging Rock horse races one Australia Day, when a kangaroo hopped across the track mid-race. It’s hard to imagine anything more Australian than that! It must have been an amazing concert. What a backdrop! Thanks for your review, link & participation in Australian Literature Month. In the past I’ve had many a lovely picnic at Hanging Rock, it is indeed a rather beautiful (and magical!) place. I imagine seeing Bruce Springsteen there would have been rather exciting — such a terrific backdrop for a concert! Thanks for hosting Australian Literature Month and for supporting a very worth cause! How lucky you are: I looooove Bruce Springsteen! You’re right with the small details adding to the mystery and the consequences on the reader. It was the first time I had read the book (I discovered it thanks to the Australian Literature Month). I have really like it but, unfortunately, I haven’t been really enchanted by the movie. I haven’t seen the movie for years but loved it when I was younger. If I had to make a choice, the book would win! For me the movie would win. But I liked the book a lot too. I visited the rock a few times when I lived in Melbourne – I liked to take interstate and overseas visitors there. It really does have an eerie quality. You should not believe that this so-called ‘missing 18th chapter’ was written by Joan Lindsay herself, because it probably is not. There is no material evidence whatsoever for this idea: no manuscript, no typoscript, no annotations, no notary document transferring the rights to her publisher, no ‘last will’ in which Lindsay says she wants the chapter published after her death. All we have is hearsay, and more hearsay, by her editor/publisher, who made quite some money off the published “18th chapter” and the renewed interest in ‘Picnic’. My best guess is that this is a total sham. Lindsay was a fierce and vocal advocate of her novel as being conceived of and written as open-ended. She loathed the idea of there being some practical who-dunnit solution to the book. And seriously, the solution totally undermines the literary and philosophical qualities of this great novel. So please take the ‘missing 18th chapter’ for what it most probably is – a sham.